On June 23, 2011, astronomers using the European Space Observatory (ESO) released an image of the complex and bright nebula surrounding the Betelgeuse, a massive star in a relatively short-lived phase as a red supergiant. Obtained using the VISIR instrument on the ESO’s Very Large Telescope (VLT), the mid-infrared image reveals that the nebula extends some 400 AUs across. By comparison, the gigantic, dying star at the nebula's core is only some 4.5 AUs wide. The astronomers believe that the nebula is composed of gases and dust particles thrown off by Betelgeuse, which was probably formed by huge plumes of gas that extend into space from the star’s surface and their ejection as the result of "the vigorous up and down movement of giant bubbles in Betelgeuse’s atmosphere -- like boiling water circulating in a pot." Over time, the plumes seen close to the star are believed to have moved and expanded into the irregular, asymmetric structure of the clumpy looking, outer nebula. The nebula's dust particles are believed to be made mostly of silicate and alumina, which can an integral part of the crust of rocky, inner planets (such as the Earth) around stars that form after the death of red supergiants such as Betegeuse, probably as Type-II supernovae (ESO photo release). Larger and jumbo mid-infrared image. Betelgeuse, or Alpha Orionis, is now estimated to be located around 430 +/- 100 light-years from Sol (based on a HIPPARCOS Plx= 7.63 +/- e_Plx= 1.64 mas). 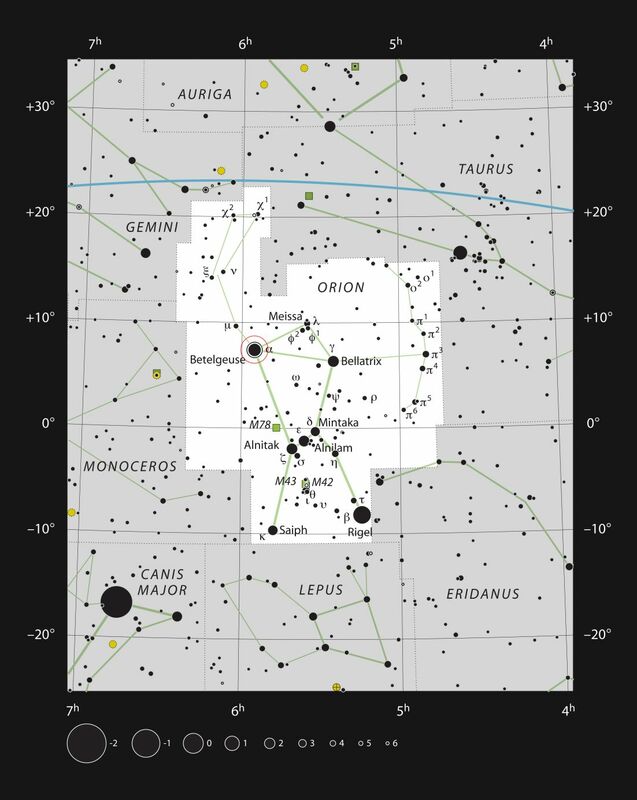 It lies in the northeastern part (5:55:10.3+7:24:25.4, ICRS 2000) of Constellation Orion (see chart and labelled photo), the Hunter -- east of Bellatrix (Gamma Orionis); northeast of the belt stars of Alnitak (Zeta Orionis), Alnilam (Epsilon Orionis), and Mintaka (Delta Orionis), and Rigel (Beta Orionis); and southeast of the Crab Nebula and Pulsar. In the venerable Star Names: Their Lore and Meaning, Richard Hinckley Allen noted that its proper name, Betelgeuse, is derived from the Arabic for "Ibt al Jauzah" (the Armpit of the Central One). 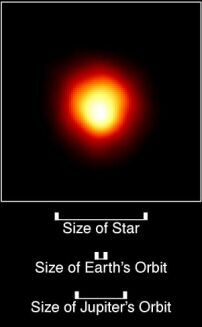 Betelgeuse, may be the brightest spectral type M ("red") star in Earth's night sky. Although the star is the closest so-called red supergiant to Sol, its color appears more orange than red to Human eyes. Like many of the stars of Orion, it was probably formed a few million years ago from the molecular clouds observed in Orion but has evolved rapidly due to its unusually high mass. The star is a member of the "Orion OB1 Association," where massive young objects with over 10 times the Sol's mass can be found in abundance (more on OB associations and stellar nurseries). No stellar companions observed in past centuries have been confirmed, including speckle detections of two close objects at eight and 67 AUs (Karovska et al, 1986; and 1985). Larger and jumbo star chart. In 1836, Sir John Frederick William Herschel (1792-1871), portrait), the son of Sir William Friedrich Wilhelm Herschel (1738-1822, portrait), noticed that Betelgeuse had changed in brightness. Astronomers now know that these regular brightness variations are caused by changes in the actual size of the star's atmosphere. 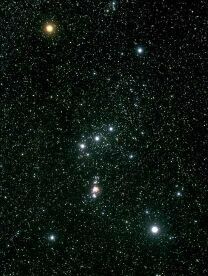 According to Robert Burnham, Jr. (1931-93), Betelgeuse is the only marked variable among the first magnitude stars as well as the 11th brightest star in the sky. It is a well known semi-regular, pulsating variable, whose main period appears to be around 5.7 years with shorter periods of 150 to 300 days superimposed. The star has a peak magnitude of 0.2 in 1933 and again in 1942. At minimum brightness, as in 1927 and 1941, the magnitude may drop below 1.2, a difference in light intensity of about two times. 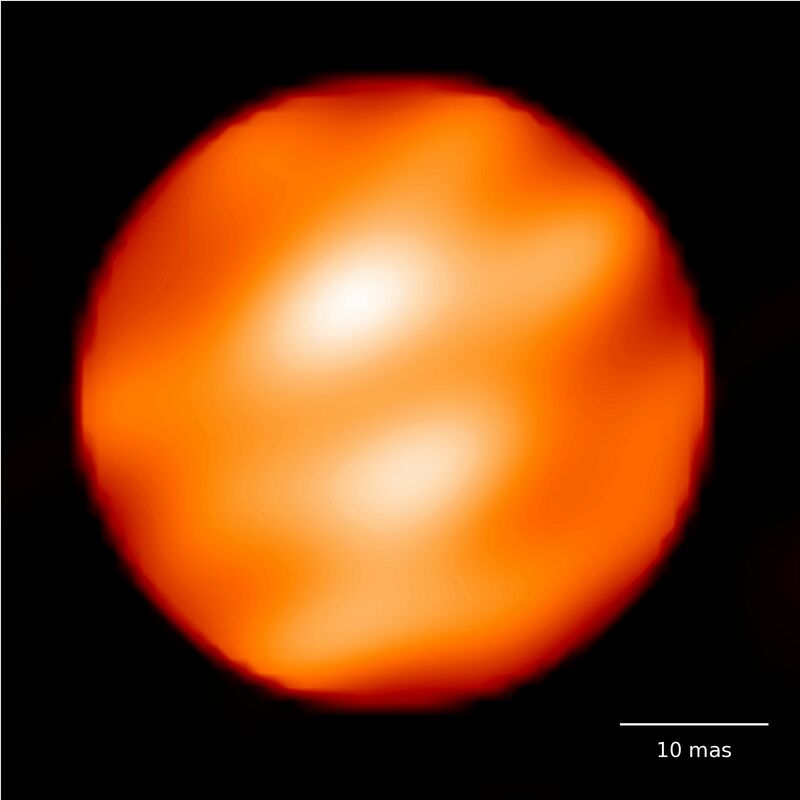 In an October 21, 2009 pre-print, a team of astronomers released a new image of Betelgeuse which they reconstructed from H-band interferometric observations, made with the three-telescope interferometer of the Infrared Optical Telescope Array (IOTA). The observations were used to analyze the spatial variation of the star's photosphere (including its diameter, limb darkening, effective temperature, surrounding brightness, and bright or dark star spots. Using different theoretical simulations of the photosphere and dusty environment to model the visibility data and two imaging reconstruction algorithms, they were able to derive an updated effective temperature of 3,600 +/- 66 Kelvin and resolve two bright spots on the star's surface that appear to be very large and hot, convective cells that are rising from below the star's surface (more discussion at Astronomy Picture of the Day; and Hautbois et al, 2009). rising from below the star's surface (more). 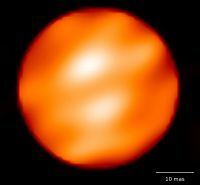 Betelgeuse is a red supergiant star of spectral and luminosity type M1-2 Ib. The star may have between 12 and 17 times Sol's mass (ESA), over 650 times Sol's diameter, and around 40,000 to 100,000 times its bolometric luminosity. The European Space Agency's astrometry satellite HIPPARCOS has measured the star's distance from Earth to be around 430 light-years, giving it an absolute visual magnitude of -5.1 (based on a HIPPARCOS Vmag= 0.45) and a visual luminosity of 9,400 times Sol's. In 2008, however, a new analysis of HIPPARCOS data generated a new distance estimate of 643 +/- 147 light-years for the star (Harper et al, 2008). 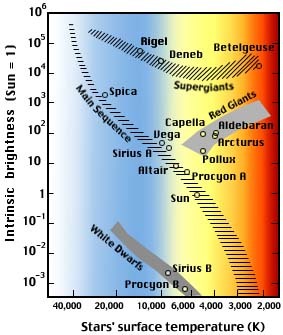 With an effective surface temperature of 3,600 +/- 66 Kelvin (Hautbois et al, 2009), Betelgeuse radiates mostly in infrared wavelengths, so that only around 13 percent of its radiant energy is emitted in the form of visible light. 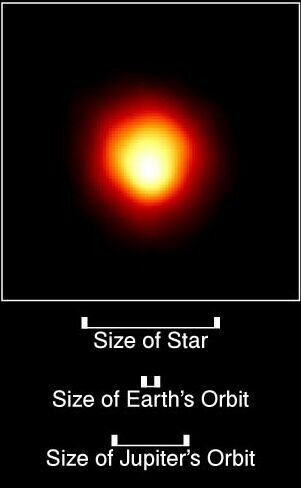 The most likely star-formation scenario for Betelgeuse suggests that it is "a runaway star" from the Orion OB1 Association and it was originally a member of a high-mass multiple star system within Orion OB1a, which includes the late type-O Alnitak (Zeta Orionis), triple star system (Harper et al, 2008). as well as red light. Various measures, particularly those made at higher energy wavelengths where the star's outer gases are particularly opaque, suggest an enormous size (more discussion). 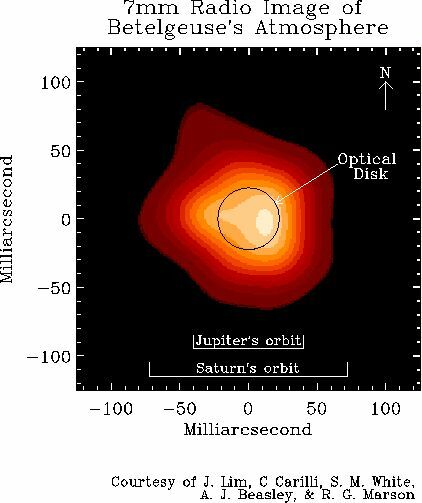 In red light, Betelgeuse has an angular diameter of 0.054 arcseconds at 720 nm (Wilson et al, 1992), so that it would extend to 3.6 AUs into the Main Asteroid Belt within the Solar System (for a diameter of 7.2 AUs in red light). In more energetic ultraviolet light, its radius has been measured at over eight AUs out (for a diameter of 16 AUs), or more than twice that at optical wavelengths. Finally, the large radio photospheres of red giant and supergiant stars give rise to detectable thermal radio emission, so that in radio wavelengths, the star's has been found to extend beyond Saturn's orbit (more discussion). Further ultraviolet and far ultraviolet images of the star revealed a chromospheric diameter as large as 260 to 270 milli-arcseconds, or 34 to 35 AUs -- between the orbits of Neptune and Pluto (Timothy et al, 2002; and Uitenbroek et al, 1998). Betelgeuse is surrounded by shells of dust and gas that it has already blown off through a very strong stellar wind. There is a partial ring of dust lying out at around three times its radius, but more was found at around 650 AUs (James Kaler, 2001; and Rinehart et al, 1998). Even more dust is found around 12,000 AUs out, or 3,000 times the stellar radius. At about 36,000 AUs (or 1,000 times the stellar radius) or so, there is also abundant gas (James Kaler, 2001). 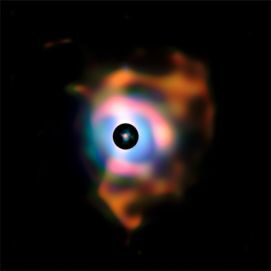 In addition, there is a great, assymmetric shell of dust extending to at least 3.3 light-years or one parsec from the star (Baud et al, 1984). Although Betelgeuse is very large in diameter, astronomers believe that it contains no more than 20 Solar-masses so that the star has an average density less than air (University of Leicester Astronomy Society). Massive stars use their fuel quickly and do not live very long. Although Betelgeuse may only be around six million years old, core hydrogen for thermonuclear fusion has already run out at its core, so that gravity has contracted the core into a hotter and denser state to fuse helium into carbon and oxygen and produce enough radiation to swell out its outer envelopes of hydrogen and helium. The star is relatively rich in nitrogen compared to a less evolved star like Sol (Lambert et al, 1984 ). Its extreme luminosity is probably being generated by a mass so large (e.g., 15 to 17 Solar-masses), so that eventually the star will fuse higher elements all the way to iron and collapse and explode as a supernova (James Kaler, 2002). 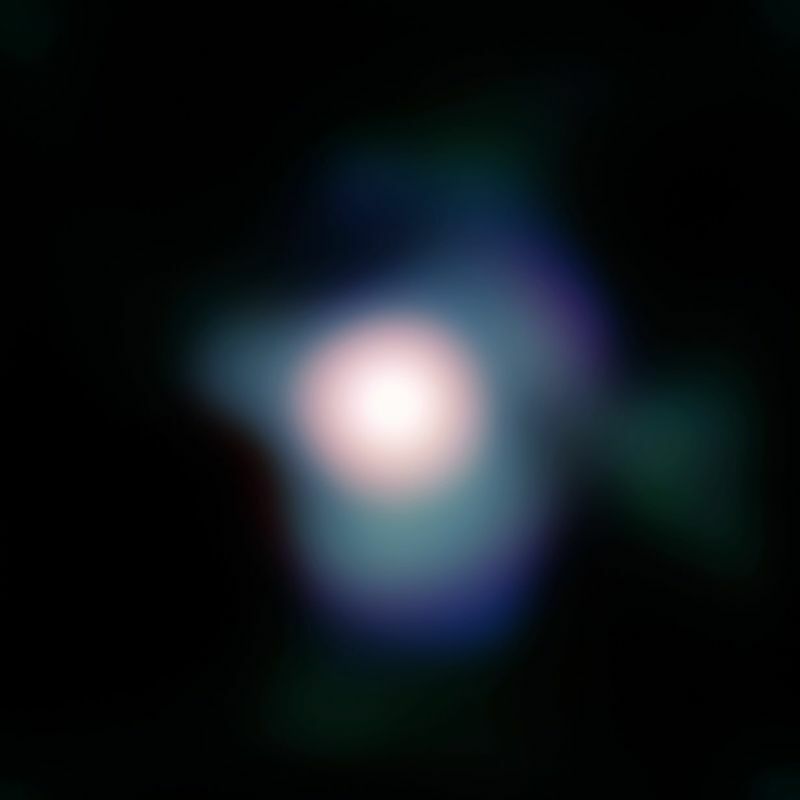 If Betelgeuse actually has only 12 to 14 Solar-masses, however, it may become one of the exceedingly rare neon-oxygen white dwarfs (rather than the more common ones made mostly of carbon and oxygen nuclei). Useful catalogue numbers and designations for the star include: Alp or Alf Ori, 58 Ori, HR 2061*, HIP 27989, HD 39801, BD+07 1055, SAO 113271, FK5 224, and ADS 4506 AP. Betelgeuse is an irregular pulsating variable that exhibit changes in magnitude from 0.2 to 1.2, and in diameter from 550 to 920 times the diameter of the Sun (University of Leicester Astronomy Society). In 2000, astronomers announced the detection of statistically significant cycles in "longwave" (1900-3200 Å) ultraviolet light radiated by the star at 0.531 years (just over six months) and 3.46 years Rinehart et al, 2000). The star's variability may also be related to periods of mass ejection and the formation of dust grains (Leo Goldberg, 1984). The light variations of Betelgeuse are not completely understood. Astronomers think that the outer layers of the star expand slowly for several years and then shrink again, so that the star's surface area alternately increases and decreases, the temperature rises and falls, and the star brightens and dims. Red supergiants pulsate this way because their atmospheres are not quite stable. When the star is smallest, the atmosphere absorbs a bit too much of the energy passing through it, so the atmosphere heats and expands. As it expands, it becomes thinner. Energy then passes through the outer layers more easily so that its gases cool, and the star shrinks again (AAVSO page on Betelgeuse). In 2000, however, the pulsations of the star were found to beat assymetrically, possibly because of hot spots in its chromosphere from a few, unusually large convection cells, and subsequent observations found evidence for shockwaves from warm gas traversing cooler regions of its extended chromosphere (2004 CfA press release). 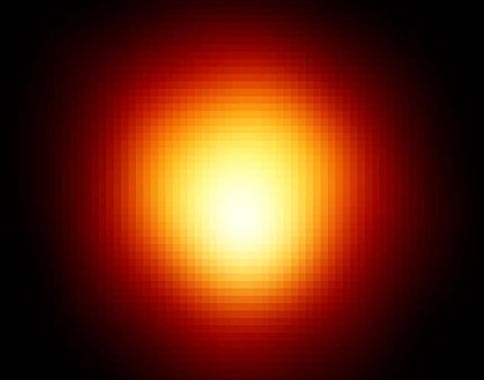 In 1995, Betelgeuse became the target of the Hubble telescope's first direct image of a star which revealed an enormous hot spot in its atmosphere. Instead of lots of little sunspots as on most main sequence stars, astronomers found an enormous bright area more than 2,000 °K hotter than the surrounding surface of the star. Turbulence below the star's surface may also have been driving a 420-day oscillation (whereby the star "rang" like a bell) and may cause changes in the observed hot spot (more from STScI press release, Astronomy Picture of the Day, and Gilliland and Dupree, 1996). beyond the orbit of Saturn (more). In 1998, a team of astronomers announced that observations with the National Science Foundation's Very Large Array (VLA) radio telescope showed that the star has giant convective plumes which propel gas from its surface (photosphere) up into its atmosphere. Previous observations with the Hubble Space Telescope at ultraviolet wavelengths showed that the star's atmosphere contains very hot gas at about twice the surface temperature. 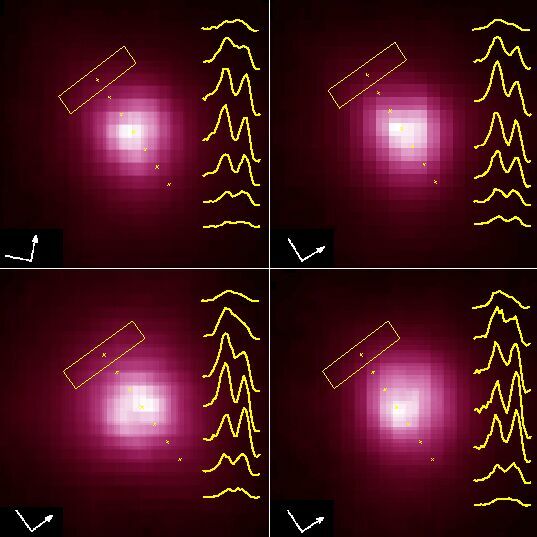 The VLA images showed that there also is lower-temperature gas throughout the atmosphere. This gas is near the surface temperature at low heights and decreases in temperature progressively outwards. Although its existence was not previously suspected, this lower-temperature gas turns out to be the most abundant constituent of Betelgeuse's atmosphere. (NRAO press release). Such refinements in the images of Betelgeuse's atmosphere has been helping to resolve the mystery of how massive amounts of dust and gas are expelled from red supergiant stars, an important source of enrichment for the interstellar medium. More recent observations suggest that the relatively cool environment at lower levels allows dust grains to condense effectively, from which they can be strongly propelled in to deep space by intense radiation that carries gas with them. On July 29, 2009, astronomers (including Pierre Kervella and Keiichi Ohnaka) working at the European Southern Observatory announced that they had obtained the sharpest images ever of the red supergiant Betelgeuse. In their images, they detected a large plume of gas extending into space from the star's surface, which extends across a length of at least six times the diameter of the star (roughly the distance between the Sun and Neptune). The images indicate that the outer shell of the star is not shedding matter evenly in all directions, but primarily through a plume that may be ejected by large convective gas bubbles in Betelgeuse's atmosphere which is moving vigorously up and down. The convective bubbles of gas are as large as the star itself (ESO press release; Astronomy Picture of the Day; Kervella et al, 2009; and Ohnaka et al, 2009). In results presented on June 9, 2009 at the 214th Meeting of the American Astronomical Society, astronomers (including Charles H. Townes, Edward H. Wishnow, Dale D.S. Hale, and B. Walp) reported that Betelgeuse appears to have decreased its diameter by more than 15 percent since 1993 (UC Berkeley press release; Townes et al, 2009; and Rachel Courtland, New Scientist, June 10, 2009). Past observations have indicated that, partially because of roiling convection cells beneath its surface, the star's surface has been observed to "wobble in and out" along with two pulsations, one restarting annually while the other cycles over six years. Based on long-term monitoring at 11.15 micrometers using the Infrared Spatial Interferometer at Mount Wilson Observatory, however, the star's diameter appears to have progressively shrunk from 11.2 to 9.6 AUs; as the star's radius is now just under about five times Earth's orbit distance, having shrunk by a distance equal to the orbit of Venus. It is still unclear whether the star is experiencing a long-term oscillation in its size, undergoing initial contractions towards a collapse or a blow off of material related to its impending death as a red supergiant via a supernova, or simply rotating to present a different side of its bumpy surface (and so appear to change in size). Although the star appears spherically symmetrical at present, Townes and former graduate student Ken Tatebe had observed a bright spot on the surface of Betelgeuse in recent years. Try Professor Jim Kaler's Stars site for other information about Betelgeuse at the University of Illinois' Department of Astronomy. More information and links are also available from SEDS. 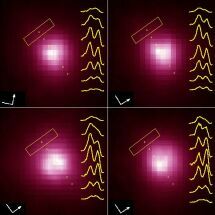 Additional information is also available at Alcyone Astronomical Software's page on Betelgeuse. 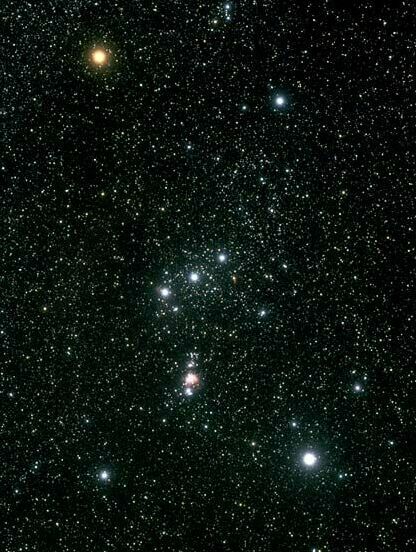 Constellation Orion is named after a legendary Hunter in Greek mythology. According to one story, Orion died after being stung by a scorpion. He was placed in the sky where he sets in the west while his slayer, Constellation Scorpius, raises in the east. Followed by his two dogs, he is now fighting the bull Taurus. According to another story, however, Orion was banished to the sky by the Gods after boasting of how many animals he would kill (to impress Eos). Now he and his dogs, constellations Canis Major and Minor, chase the constellations representing animals but can never catch them. For more information and an illustration of the constellation, go to Christine Kronberg's Orion. For another illustration, see David Haworth's Orion.